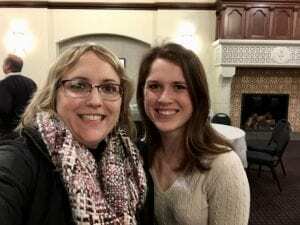 Dr. Cyrielle Faivre was honored to be invited by student Emily Locke (public and community service studies major, French minor) to attend the “Thank a Feminist Dinner.” This event was organized by Women Will on November 14, 2018 in the Great Room in Ruane. Women Will is a discussion-based club centered around increasing awareness of gender and women’s issues on and off campus. They provide a safe, supportive space for all members of the Providence College community to learn and share their knowledge of gender equality in addition to organizing opportunities for social activism. Please consider joining Women Will during their weekly meetings on Tuesdays from 8 – 9 p.m. in Feinstein 403 (the Community Room).